So I promised a catch-up post and this is the first of a few. Whilst I have been writing my thesis in (what at times felt like) a hermit-like cave for many many months, I have somehow managed to fit some fun in around it too. After I redrafted my conclusion at the end of May, Andrés and I made a trip to Spain so I could meet his family and see his hometown. It was my first time in Spain and I absolutely loved it, although I desperately need to work on my Spanish (currently non-existent). I discovered there is nothing more frustrating than being unable to communicate with someone, particularly when you have many many questions to ask. Andrés comes from a small town (he swears it is not that small but really, when you come from Joburg, everywhere else seems pretty tiny, and yes that is my Joburg-biased voice talking) called Chiclana de la Frontera. It’s on the Andalusian coast, near Cadiz. 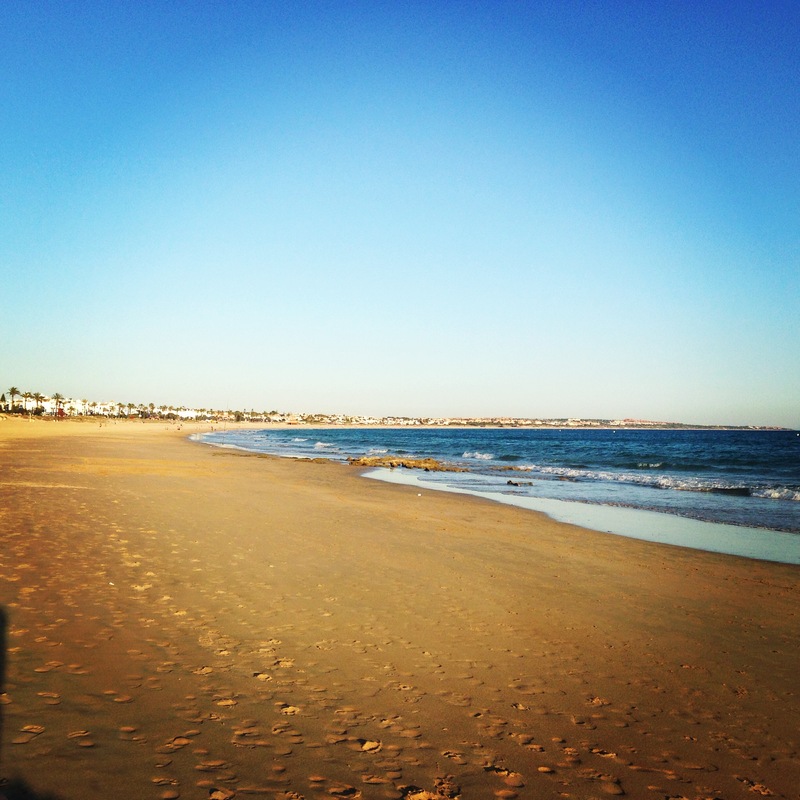 Chiclana has the most incredible beach (the picture above) where we spent several afternoons swimming, hanging out and sun worshipping. I met various members of Andrés’ family – his parents, his grandparents, various uncles and cousins. We ate a lot – I even tried tiny fried birds (I am not convinced). We spent several mornings in Chiclana’s town centre. Andrés took me to the covered market, where you can get fresh fish, fruits and vegetables and meat. We wandered aimlessly along the cobbled streets, went down to the river, and visited several cafes for fino and tapas. I particularly loved how over the hours of lunchtime people popped into the cafe (where we stood at the bar talking and watching the goings-on) buying fino or beer and talking to each other. It was such a significant change to my own experience of people rushing from one meeting to the next, grabbing lunch to go and rushing off again. Here there was time to talk and share a drink, and the occasional snack too. One day we drove to Cadiz, which, alongside Seville, was one of my favourite places. 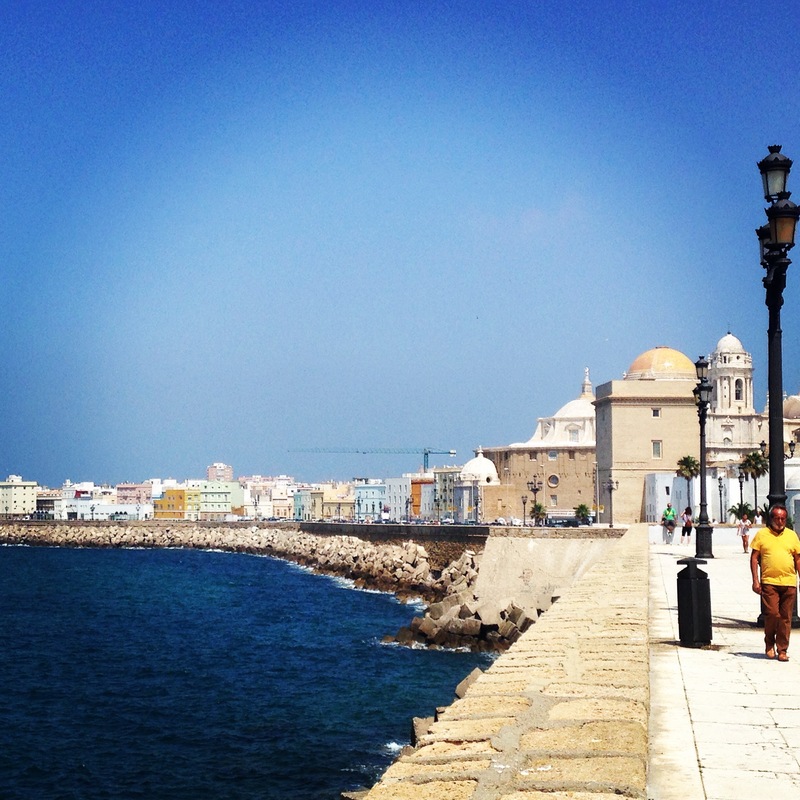 I loved everything about Cadiz – the clear blue water, the fig trees, the food, the quirky streets, the old buildings. 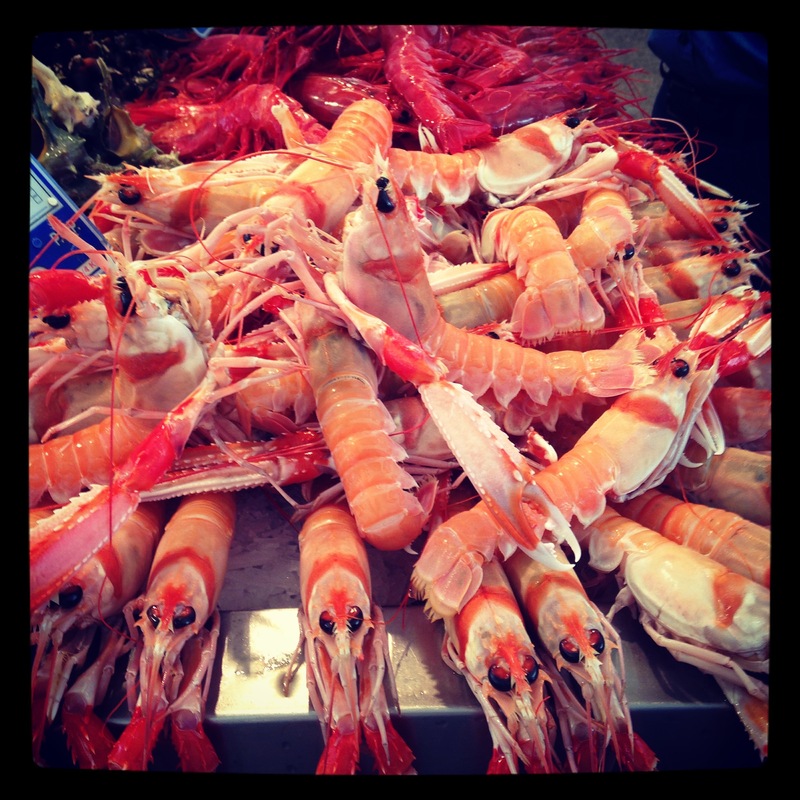 But my absolute favourite in Cadiz was the market. The market is in an open square, the traders are (undercover) around the edge and in the centre, and in-between, there are tables and stools so that you can buy things to eat and enjoy them in the sunshine whilst people around you shop and talk about food. It strikes me as incredibly special to be able to visit such a place to do your weekly or daily shop – where you can strike up conversations with your favourite butcher or fishmonger, dally awhile amongst the noise and bustle, and delight in the colours. We wandered through the city, watching people sunning themselves on the beach, boats anchored just off-shore. We visited the castle where we found a random (but fantastic) collection of old ophthalmology equipment (I took photographs for my dad) and ate a spectacular lunch at a restaurant where a friend works as the pasty chef. I also insisted we poke around Cadiz Cathedral, mainly because I love churches for their aesthetic beauty but also because I am fascinated by their power and wealth. Andres was super chuffed because he charmed the guys at the entrance into giving me a student ticket (despite my lack of student card). The cathedral is beautiful and intimidating – the way one should be, I imagine. Finally we took refuge from the heat in a museum where Andrés showed me a painting of the signing of the 1812 Spanish constitution. More on Spain next week but in the meantime, here is this week’s reading! This article was in last month’s Observer Food Monthly magazine. It details how one school has successfully changed their lunchtimes and food to suit their children’s needs, with the help of a wonderful chef. Feel good reading about the world, if you need it. I was reminded of the article above because I was reading today’s Observer Food Monthly. It has a great article on chefs and their gardens. I love stories about people growing and then cooking food and the pictures of the gardens are inspiring. I particularly love how so many stories begin with gardening in childhood – with grandparents or parents. I also read Rachel Roddy’s article in the FT. I love the way Rachel writes about food. If you haven’t read her blog about her kitchen in Rome, do. I want to learn to write about food and life the way she does. It reminds me strongly of writing field notes, paying attention to the small details of everyday life but somehow I haven’t yet learnt to do that in my ordinary day-to-day living. Her book – Five Quarters: Recipes and Notes from a Kitchen in Rome – is on my list of things to buy soon. I’ve been listening to The Moth on the Power of Storytelling via The New York Public Library podcast. Inspiring storytelling and fascinating ideas of how to tell stories – Carly Johnstone’s piece was particularly gripping. I’m still busy with H is for Hawk (almost but not quite done) but I’m also reading Ghosts of Spain which I actually started before our trip but then put down. It’s an expat investigation of the art of forgetting (about Franco) in Spain. I’ve found it historically fascinating but I’m also enjoying it for the insights of an English person living there. Finally, I’m working on a book chapter on gardening and have been perusing My Cool Allotment for research purposes. The photographs are fantastic but the stories of the allotments and community gardens are just wonderful. If you’re in need of inspiration for a green space, pick this up!